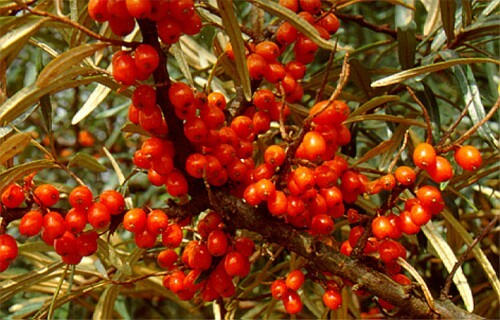 The article below on Seabuckthorn will have everything you need to know! I would like to thank Douglas WM Kalman who is the writer of the article. The purpose of this article was to help customers in our Alive Health Centre, Morning Sun and Supplements Plus locations, but it would be nice to be able to enjoy the article in your own home. Hope you enjoy! Just briefly, these are some of the things that Seabuckthorn is known for and Dr. Oz discussed these last week. 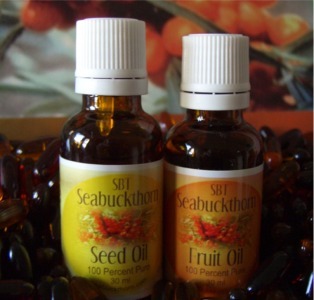 1) What is the difference between Seabuckthorn Seed and Fruit (Berry) Oils? the skin first. Get used to applying the Seed Oil, then progress to using the two oils together. This is the ultimate serum blend for the skin. It is called SBT Single Source Oil and it is a blend of one part Seed Oil and one part Fruit Oil. Creating a different blend with a higher concentration of Seed Oil makes a lot of sense; adjusting to ones individuals needs is appropriate. I encourage you to do your own “experiments” by treating your skin to different combinations. Have fun with this. The Seed Oil, from the seed of the berry, is again, a great way to discover Seabuckthorn’s healing and regenerative properties inside and out. Try a drop on the back of your hand, and your customer’s hand, and rub it in to see how quickly and easily it absorbs and that it does not feel greasy and leaves your skin feeling soft and supple. This is how easy it is to sell. Briefly, the constituent profile difference between the Oils is the Seed Oil has up to 95% EFA with the same 106 nutrients in total that fruit oil has, including 22 fatty acids, 42 lipids, 6 fat soluble Vitamins (including Vitamin K and all 8 isomers of Vitamin E), 36 kinds of Flavonoids and Phenols, Lecithin, (with the PC being 47%. ), and a recently new total of 41 discovered Carotenoids. Also include 8 Phospholipids and 17 Phytosterols. The Seed Oil has Omega 3 and 6 at an optimum one to one ratio and contains less than 2% Omega 7. Seabuckthorn Seed Oil is a remarkable whole food supplement and arguably has more healthy components and constituents than any other supplement, or food, beneficial to health. The Fruit Oil’s profile of nutrients compared to seed oil includes, 3 times more palmitic acid, is up to half palmitoleic acid, (Omega 7), twice as much Lecithin and Vitamin E and significantly more concentration of Carotenoids, specifically, Beta-Carotene and Lycopene. The dark orange color is attributed to high concentration of Carotenoids. Functionally, using straight fruit oil alone topically is not recommended because of the dark color and slower skin absorption time. No harm is done using it alone, it does create results of leaving the skin soft and supple if one is patient enough. Also internally, it stands on it’s own as a giant among supplements and whole food supplements. 2) Which products are for what? i.e. What do you use the seed oil for? What do you use the fruit oil for? Etc. As mentioned, start with the Seed Oil first for anything from moisturizing to very therapeutic purposes, mostly skin issues and there are many internal issues Seabuckthorn is used for. It’s for everything the body needs, topically and internally. As a Canadian Company, SBT Seabuckthorn focuses on natural treatments for Acne and Rosacea and leaves the discovery of everything else to the experts. Researching the constituents contained in SBT and then researching the effects on the body of those nutrients opens up an understanding of why SBT is an effective treatment for Acne and Rosacea, keeping the context: all functions are related and affect each other. Dr. Oz says Seabuckthorn Oil is the best thing for Acne!! The complete internal SBT package is the four core products, Seed oil, Fruit Oil, Berry Flavone Capsules and Tea. They represent 192 of the 194 known nutrients, certified organic, all from the same plant source with the optimum delivery, or utilization system with a one to one ratio of Omega 3 and 6 to create energy and to make brand new healthy cells. For all skin concerns including Rosacea and Acne start with the Seed Oil Topically. Again, using the Seed Oil and Fruit oil together is the ultimate serum you can put on your skin. But do the combination at a “Therapeutic Time” during your day or evening, because it takes time to soak in and for the color to settle down. If your skin is still tinted orange by the time you want to have it all soaked in, then wash off the remainder. You’ll find that it leaves the skin a wonderfully soft, supple and resilient. Following up by applying your favourite SBT Facial Cream. Berry for Rosacea, Tea for Acne, it will compound the benefits. Most peoples skin is very thirsty, so this is the ultimate and best care you can do. It absorbs quickly and may leave a perception it’s drying the skin, perseverance will result in the complete opposite being realized and pays tribute to how we need to be supplementing the skin from the inside out. Super Oxide Dismutase, (SOD). 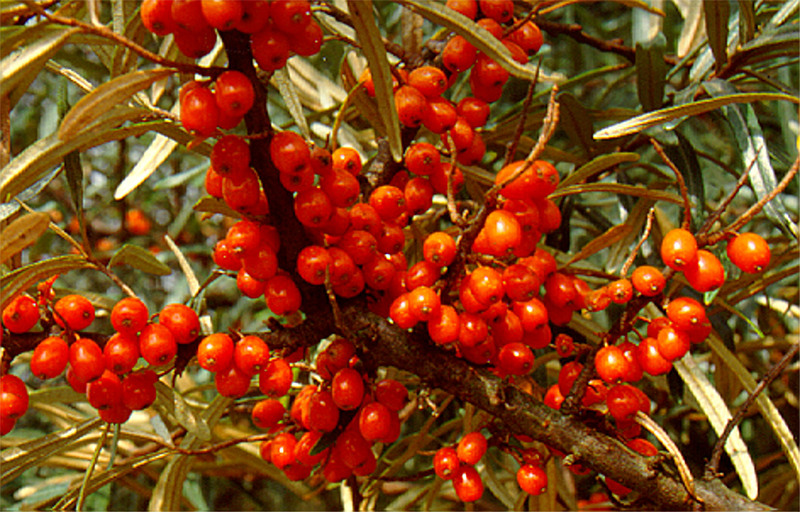 This nutrient like many in Seabuckthorn is also an anti-inflammatory. It activates the body’s production of its own Antioxidants, Catalase and Glutathione Peroxidase, (Master Antioxidant), which in turn “recycle” Vitamin C and E as Free Radical Scavengers. This maximizes the efficiency of the healing processes orchestrated by the body. Taking SBT Berry Flavone capsules with the seed and fruit oil is ideal. Consider this supplementation a profound source of nutrition linking it directly to improving Cardio-vascular health from the smallest blood vessels, (Capillaries), to right back to the heart. SBT Tea leaf has an anti-inflammatory nature primarily from Quercetin, Isorhamnetin, Kaempferol and Catechins. These are natural anti-histamines. Of course there are many other nutrients in the tea including Polyphenols, many Minerals, including Calcium, Magnesium, Manganese, Potassium, Copper, Zinc, etc. The tea has a strong concentration of Carotenoids such as Beta-carotene, Lycopene, Lutein and Zeanathan. Ellagic acid benefits throat and esophagus membrane health. There is a profile of 12 fatty acids with Omega 3 having by far the highest concentration and Vitamin E. The leaves are a rare 24% Protein. Brewing the Tea all day or night is recommended. It is very pleasant tasting hot or cold and has been accepted with enthusiasm by the general public. One may get up to 6 cups of tea or more per tea bag. Drinking the tea is a great way to get started with SBT Seabuckthorn. Keep in mind that the Canadian Scientists measuring the nutritional value, did it 3 times to believe the high content of nutrition. Consider SBT Tea to be the healthiest tea on the market. Start with the Seed Oil, topically and internally. How much? Topically a few drops depending on the area. 100% pure on the face, for larger areas of the body use the SBT Anti-Aging Body Cream. Internally, start with one capsule a day for one week, then go to two a day. If you have an acute health situation take more. Taking drops from the bottles is an alternative, 10 drops from once to 3 times or more a day is okay. We cannot get too much of this kind of whole food nutrition. The SBT Single Source capsules are a step up from the Seed Oil Capsules. Everyone can start on the Single Source capsules, except for people with a very challenging Acne condition. Wait till the Acne has cleared up significantly before trying the Single Source, topically and internally. Drinking SBT Tea maybe the preferred starting place for some. Topically, starting with a SBT Therapeutic Moisturizing Cleansing Bar is also effective. Berry Bar for Rosacea and general conditions and Tea Bar for Acne and all other conditions. 4) Which Cream is for what condition? SBT Therapeutic Berry Cream is intended for Rosacea plus more. Has Seed and Fruit Oil. SBT Therapeutic Tea Cream is intended for Acne plus more. Has Seed Oil and Leaf Extract. 5) Are the Seed and Fruit and Single Source Oils in the bottles edible? Yes, the bottles of oil, seed and fruit, are exactly the same as the capsules, except without the capsule. 100% pure whole food nutrition, great for the mouth mucosa: cold sores, sore throat, cankers, gingivitis and more. Please see the clinical and studies on our website, www.seabuckthorn.com. 6) What else do I need to know about Seabuckthorn? This is a Summary of many studies. Seabuckthorn is known to be a Cardiotonic, stomachic, dermatropic, antioxidant, anti-infection, anti-fungal, anti-inflammatory, anti-radiation, anti-constipation, healthy cholesterol maintaining, blood vessel health, blood fat reducing, pro-blood circulation and pro-natural healing, Seabuckthorn nutrition has a wide range of uses both internal and external, including the prevention and cure of cardiovascular disease, cancers, ulcers (mouth, gastrointestinal and duodenal), burns, sun burns and sun burn protection, immune disease, gastrointestinal disease, liver disease, respiratory disease, urinary disease such as yeast infection, and gynecological diseases, skin disease, wounds and infected injuries, antiallergic, insect bites, etc. As seabuckthorn oils protects the white blood cell against damage by radiation and chemotherapy and speeds up regeneration of tissue cells and promoting natural healing, it can provide essential help to those under going radiation and chemotherapy for cancer patients. It is no exaggeration that seabuckthorn is a great natural herb store of natural remedies by itself, and if you decide to take just one supplement, the seed oil is a great one to start with. All other products you choose at your local Health Food Store will be more effective because of it. Therefore Seabuckthorn Products are wonderful, whether it be the Seed Oil or Single Source with the perfect balance of EFA to utilize all other nutrients, Berry Flavone Capsules, (high in SOD, Bioflavonoids, Vit C, Immune support, stress support, etc.) to increase Glutathione production or the Fruit oil for a higher quality Lethicin, Vit E, Carotenoids etc., or the Tea, as the most nutritional tea, without caffeine. 7) Seabuckthorn and Hyaluronic Acid! getting the response from the nutrition we’ve never had, promoting the best health we can achieve. This was a long article I know! As always thank you for reading. I hope you have found it useful. We look forward to seeing you at a location near you at either Alive Health Centre, Morning Sun or Supplements Plus! Have a great rest of the week everyone. CulturedCare Probiotic Gum with Bliss K 12: Oral Probiotic!